San Diego’s biggest funds posted huge investment returns thanks to 2017’s bull market, but that wasn’t enough to dig them out of their underfunded holes. Even after strong investment earnings last year, the pension funds for the county and city of San Diego are still short a combined $6.25 billion of the retirement money promised to former and current employees. 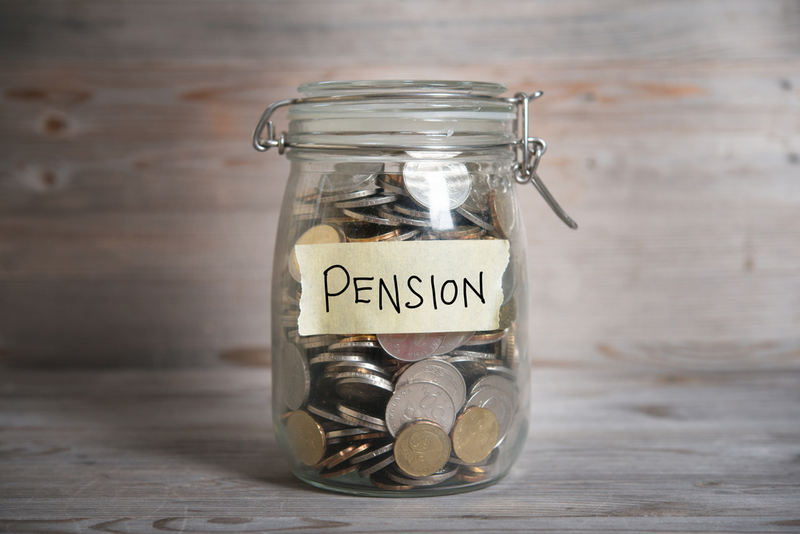 The shortfall, known as an unfunded pension liability, is the difference between pension fund assets in the bank and liabilities, or the cost of pension benefits accrued by retirees and current employees. Both the governments and their employees contribute to the pension funds. The two different retirement agencies then invest the money. If investments don’t hit their earning targets, employers must make up the difference. In the case of government agencies, that might lead to higher taxes or cuts to other services in the future. Liabilities rise each day an employee works. Longer life expectancies, employee salary increases beyond what’s projected and lowering earning expectations also increase liabilities. To help curb rising pension liabilities, the county Board of Supervisors voted this month to lower pension benefits for new hires, according to the Union-Tribune. And pension payments are mostly on the rise. The County of San Diego contributed nearly $387 million to their fund last year and will pay $473.6 million this year and $495.5 million in 2019. That doesn’t include an additional $80 million the county pays each year toward more than decade-old pension obligation bond debt. Those bond payments are expected to continue another 10 years, through 2027. At the Port of San Diego, pension contributions totaled nearly $16.8 million in fiscal year 2016 and $19 million in 2017, according to port officials. The airport paid nearly $5.4 million toward pensions in fiscal year 2016, $7.1 million in 2017 and will pay nearly $8.7 million this year. It pays more than the minimum payment required by the fund because of an airport policy requiring at least 90 percent funding, airport officials said. The city of San Diego paid nearly $255 million for pensions in 2016, $261 million in 2017, and expects to pay $324.5 million this year. The city will pay nearly $323 million next year, a small decrease thanks to a change made by the San Diego City Employees’ Retirement System. The San Diego County Employees Retirement Association, or SDCERA, anticipates earning 7.25 percent on its investments annually. It earned 12 percent last year, according to the latest numbers available, but averaged just 4.4 percent over the last 10 years. Meanwhile, the agency that manages the city, airport and Port pensions, known as SDCERS, lowered its annual earnings expectations to 6.75 percent this year and will drop them to 6.5 percent next year. The fund’s investments earned 13.5 percent last year, up from 1.1 percent the year before. Last year’s market gains at both San Diego pension systems led to an increase in assets. In 2015-16, the unfunded liability across both San Diego pension systems reached nearly $7 billion, despite pension reforms enacted at the state and local level. Gains in assets outpaced growing liabilities last year, though, lowering the combined unfunded liability to $6.25 billion in 2016-17, according to the latest numbers available. Specifically, a new report received by the SDCERS pension board Jan. 12 said assets in the city of San Diego pension account grew to $7 billion last fiscal year, up from $6.3 billion. Liabilities, on the other hand, grew from $9 billion to $9.57 billion in 2016-17. The difference, or unfunded liability, is now $2.57 billion for 2016-17, down from $2.7 billion the year before. The city’s pension funding ratio, calculated by dividing assets by liabilities, is now at 73.2 percent, according to the pension fund’s market value numbers. Click here for an interactive graphic. 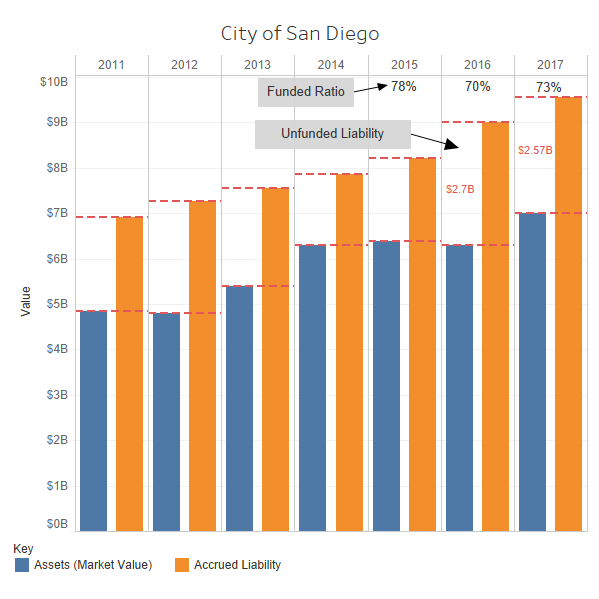 The City of San Diego’s unfunded pension liability is now $2.57 billion, down from $2.7 billion the year before. For the Port of San Diego’s pension account, assets grew from roughly $368 million to $413 million, while liabilities rose from almost $505 million to $539 million, leaving a $125.6 million unfunded liability and a funding ratio of 76.7 percent. Meanwhile, in the SDCERS account for the San Diego International Airport, assets grew to $166.8 million last year from $143.9 million the year before, and liabilities grew to roughly $183 million from $165.7 million. That’s left a $16.2 million gap, down from nearly $22 million. The airport’s pension funding is strongest, at 91.1 percent, according to San Diego pension fund disclosures. 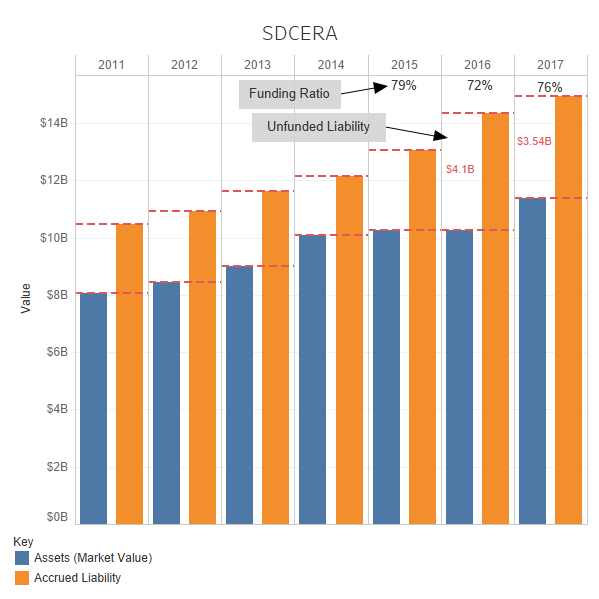 At the county pension fund, SDCERA, last fiscal year saw assets rise to nearly $11.4 billion, and liabilities rise to nearly $15 million. That left a roughly $3.5 billion gap in 2016-17, smaller than the $4 billion gap the year before. Click here for an interactive graphic. The county pension fund, SDCERA, reported a $3.5 billion unfunded liability in 2016-17, smaller than the $4 billion gap the year before. The county pension fund now has a funding ratio of 76.3 percent. It was 100 percent funded in 2007 and neared a low of 65 percent in 2009 thanks to the market crash in the Great Recession, according to SDCERA’s market value numbers. Funding ratios are a key measure of pension fund health. The county, city and Port pension funds are still below the trigger minimum level of 82.3 percent that helped precipitate the city’s pension scandal in the early 2000s when officials postponed making accelerated contributions. Thanks to a decision by the SDCERS board last year to change their “smoothing” method, whereby financial impacts are spread out over time, the city of San Diego will see some relief from their growing pension bills next year. But it won’t be as much as they thought. In September, city leaders thought they would pay $312 million toward pensions next fiscal year, instead of $329 million. New numbers show the city will actually pay nearly $323 million next year, $1.6 million less than this year’s payment. In the private sector, unlike the public, federal law deems certain large pension funds below 80 percent funded as “endangered,” and those below 65 percent as “critical.” All except the airport would be considered “endangered” under those standards, despite last year’s improvements. The Government Finance Officers Association recommends public agencies adopt policies targeting 100 percent funding for pensions. The American Academy of Actuaries agrees. Since the county and city pension funds weren’t fully funded last year, each agency missed out on millions of additional dollars they could have earned from last year’s strong investment gains. But in bad years, being underfunded avoids additional losses.